glazed over from desire and butterflies circling deep in the pit of my stomach. great in this, buy me Lauren, BUY me”. friend, Naila, to peel you away from the toad in disguise. 1) Am I buying this because it’s on sale? Many people will end up purchasing something just because it’s on sale and don’t want to miss out on a bargain. THIS IS NOT THE WAY TO SHOP! 2) What will I wear this with? Think of at least two outfits that the item can be worn with. If the item requires a whole outfit, he’s not a keeper. You don’t get into a relationship, knowing that you need another three boyfriends (or girlfriends) to complete the package. So, back on the rack! 3) Does it fit right? Buying clothes as an incentive to loss or gain weight often leads to clothes never being worn. Leave it on the rack. 4) Do I have a place to wear it to? Is there any point buying a wedding dress when there is no ring on our finger? No, then why buy an item for a future fantasy event. Girl, put it down! If you do decide you want to buy a wedding dress then get one of these Simple Madame bridal gowns, that way its not super fancy and you could wear it to different events. 5) Is it comfortable? You don’t want to be spending all day pulling up the back or itching – its not cute. If its annoying in the store its even more annoying in your wardrobe, leave it. 6) Am I buying this because of the brand? If you’re a brand junkie and only want to buy it because of the brand; step away from the rack, I repeat, step away! 6) Am I filling a gap in your wardrobe? If you already have 8 duster coats, it’s pretty obvious that you don’t need another one – unless this one, washes your hair, sorts out your love life and feeds you chocolate while your on your period…no? I thought not. Bring something new to your wardrobe; spice up your life! Lastly) Do I totally love this piece? Could you see yourself wearing this more than once (and not in the same outfit)? If the answer is yes, and you genuinely love the item, then you better get it and werk it for eternity (or at least two seasons). toads, you deserve a date with Derek Smith! importantly, keep those receipts safe! means 80-70% of your shopping money is being wasted by just hanging in your wardrobe. Need some help on deciding what you should keep, toss or giveaway? Throw a Take or Toss party and invite some of your stylish friends to help you decide whether you should keep or throw that skirt from two season ago away. If Carrie Bradshaw could do it, so can you! Get that clutter out! 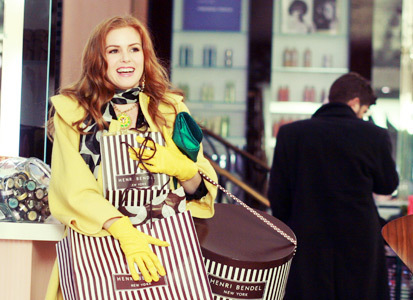 I would love to hear your shopaholic stories, share below and tell me what you think of this post; could it change your shopping ways or are you still left stuck in a rut of Rebecca Bloomwood 007? Next Post For the Love of Shoes!